Pasadena and Irvine, Calif. – – R.D. 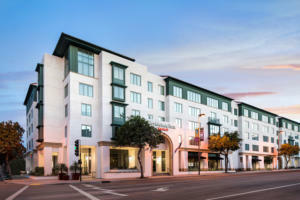 Olson Development, in partnership with Joseph Martelli Real Estate Investments, Inc., has opened the five-story, 144-room Residence Inn Los Angeles Pasadena/Old Town in Pasadena, California. Executives from R.D. Olson Development, Marriott International and project general contractor R.D. Olson Construction joined civic leaders at the grand opening. The project marks the first hotel development in the historic Old Town Pasadena area in 15 years. Located in the heart of Old Town Pasadena, Residence Inn Los Angeles Pasadena/Old Town is walking distance to a variety of entertainment options, including world class dining and shopping, and eclectic cultural offerings such as landmark theaters, lush botanical gardens, and art galleries and museums. The hotel is also within one mile of the famed Rose Bowl Stadium and nearby the prestigious California Institute of Technology, historic Dodger Stadium, and entertainment hubs such as the Staples Center, Nokia Theater and Hollywood. A large, handmade wall relief of an oak tree, made of real oak by a local artist, represents the Pasadena’s landmark Cathedral Oak tree that once divided Orange Grove Avenue in 1890. Pasadena’s iconic Colorado Bridge and Tournament of Roses Parade are also represented in artwork and vintage images throughout the hotel. Offering a comfortable, stylish retreat, the property’s interior pairs Pasadena’s rich history with the conveniences of Marriott’s latest Gen 9 Design, showcasing contemporary furnishings within a traditional, historically-inspired setting. The 94,091-square-foot all-suite hotel is designed with a room mix that includes expansive studio, one- and two-bedroom guest suites, complete with kitchens and beautiful, upscale bathrooms to accommodate the needs of the extended-stay guest. Guestroom suites offer separate living, sleeping and working areas, as well as kitchens with high-end appliances including a refrigerator, stove, microwave and dishwasher. Rooms also include spa-like bathrooms and ergonomic furniture, creating a relaxing, home-like environment. Guests benefit from a variety of public amenities such as a complimentary, full hot breakfast buffet, an oversized fitness center with CrossFit style equipment, complimentary high-speed Internet access throughout the property, a business center equipped with the latest technology solutions, and guest laundry. The property also features a 24/7 Market, which provides easy access to grab-and-go snacks and other on-the-go necessities.